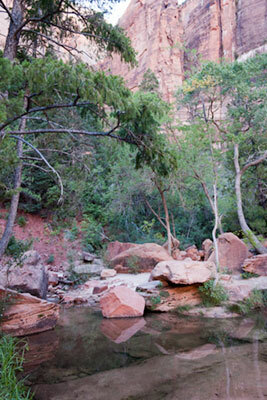 After our drive along the Zion Mount Carmel Highway, we returned to the canyon area of Zion to visit the Emerald pools. 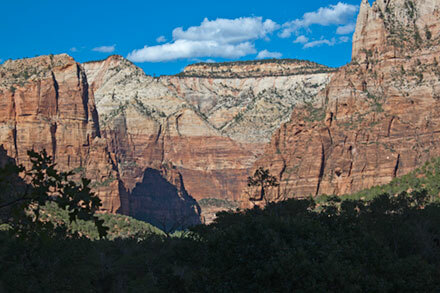 The change from the arid eastern part of Zion to the canyon area is dramatic. 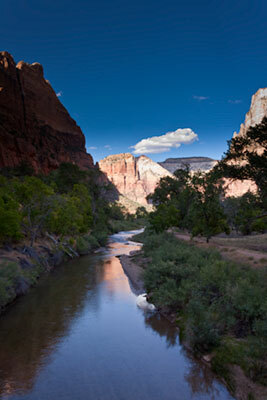 The Virgin River makes all the difference in the world--your really are in a different world. 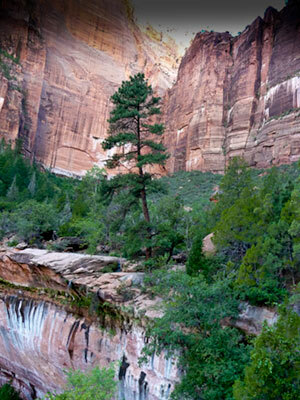 The hike to the Emerald Pools starts at the Zion Lodge and crosses the Virgin River. 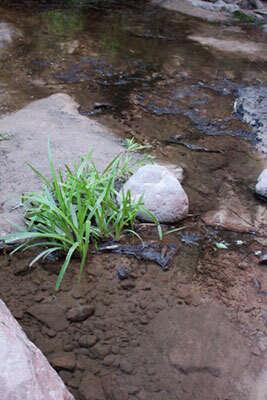 After you cross the Virgin River, you come to a split in the trail. 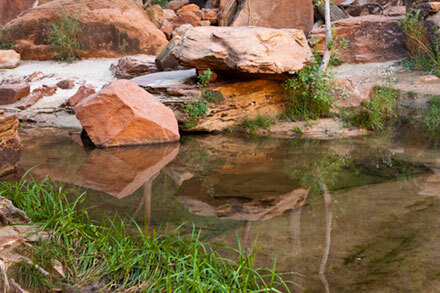 If all you want to visit is the lower Emerald Pool, take the right hand fork. If you want to visit the middle, upper, and lower pools, take the left hand fork. If you take the right hand fork, the paved trail is fairly gentle and shaded by cotton wood trees. It first follows the river, and then ascends to a wide overhang beneath the cliff face. When we were there in September, small tickles of water fell down from the top of the cliff. In the spring, these trickles are actually waterfalls. The path passes behind the cascades. After a short climb, you're at the lower pool. You can continue to the middle and upper pools from here, but you have to climb a steep set of rocky stairs and then have a fairly steep trail ahead of you. We took the left fork--the sign directs you to the Middle Emerald Pools. This trail is unpaved rocky and sandy. The trail is also mostly unshaded, so it's a good idea to have a bottle or two of water before you start the hike. You'll need it before you get back. 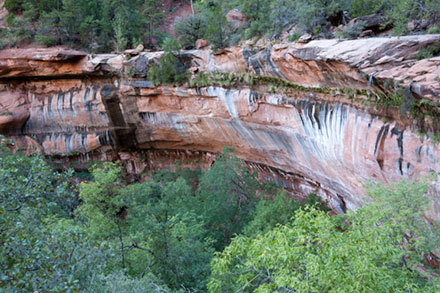 The trail ascends about 200 feet in 1 mile before you get to the Middle Emerald Pools. The first section is moderately steep but not too bad if you take your time and stop for a drink of water every so often. The trail levels off and you come to the first of the Middle Emerald Pools. By September the water levels were pretty low. This is a good place to stop, take a drink of water and enjoy the shade. It's also cooler than on the open trail. The first pool is pretty and provide nice reflections of the cliffs and red rocks. 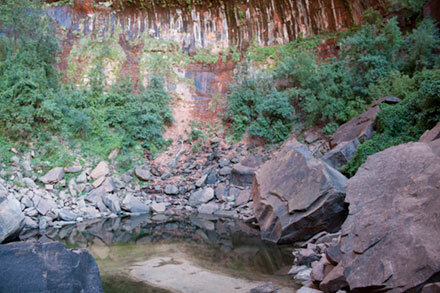 As you continue your walk, you come to a junction with a side trail that leads to the upper Emerald Pool. 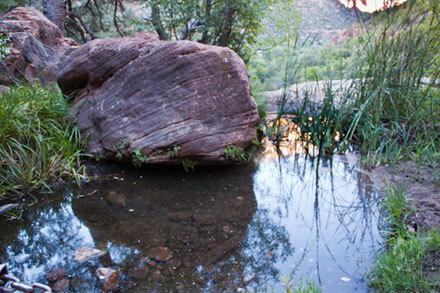 The junction occurs before you reach the second of the two Middle Emerald Pools. 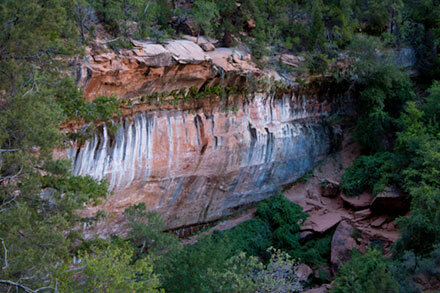 The Upper Emerald Pool trail is a steep one half mile trail that ascends about 200 feet. The trail is rocky and sandy. When you get to the base of cliff, you have to scramble down to get to the pool. But it's well worth the trip. 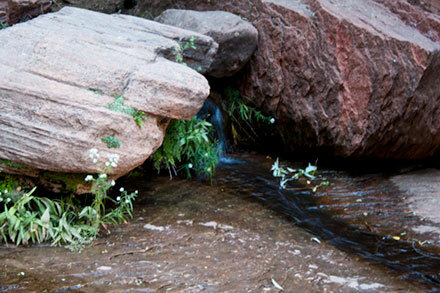 We spent awhile exploring the Upper Emerald Pool, and then headed back down the trail. 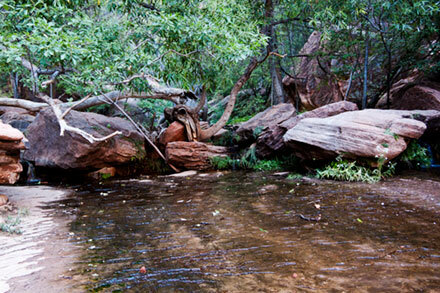 Shortly after we got back on the main trail, we came to the second Middle Emerald Pool. There was quite a bit more water in this pool than in the upper pool. It was a very pretty pool. The large rocks and the various green plants gave the pool a Japanese garden feel. The small stream feeding into the pool formed a very small waterfall. We left the Middle Emerald Pools and headed back down the path. The path down was fairly steep. And then we came to a very steep set of stairs cut into the rock. We were very glad that we were headed down these stairs instead of trying to come up them. 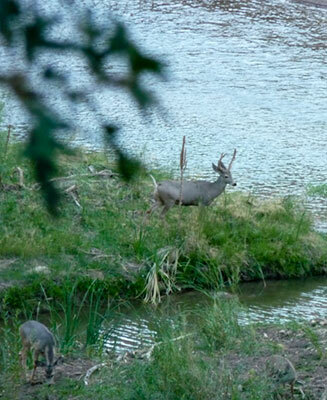 This is why I recommend taking the trail to the left after you cross the river. 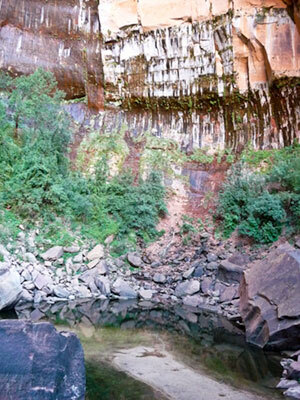 After we got to the bottom of the stairs, we had a great view of the cliff above the lower Emerald Pool. 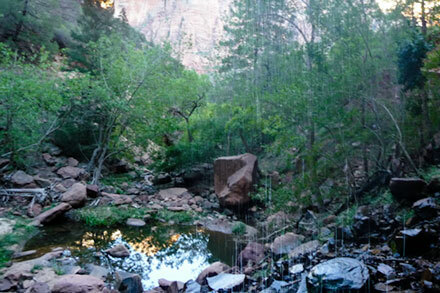 We could see small streams of water falling from the Middle Emerald Pools into the Lower Pool. 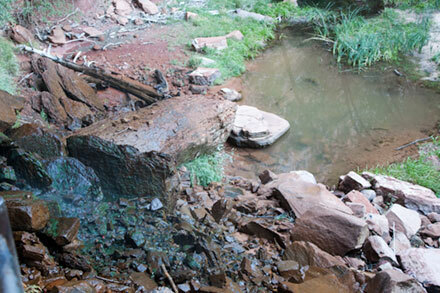 The stains on the red rocks showed that stains from times that considerably more water fell from the Middle Emerald Pools into the Lower Emerald Pool. The lower pool was much smaller than any of the other pools. After we left the lower pool, we followed the trail back down to the Virgin River. 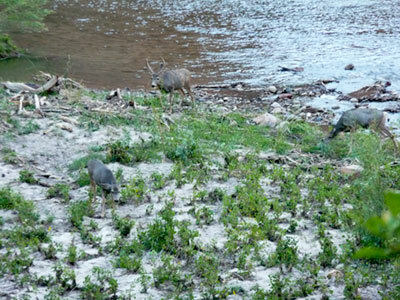 We were lucky enough to see a small herd of deer grazing near the river. It looked like the small buck had managed to gather together a small harem.